Sorry again that it has been a few days since updating everyone. We have begun our one month trial of 12 hour shifts, so the last few days I haven't done much other than work. This past weekend however, I did have the chance to go on a tour of sorts to the Bong Mine. There is a man that volunteers with Mercy Ships that lives here in Monrovia that takes people on a tour of a place out in the country-side here called the Bong Mine. It is located in Bong County and it is an old iron ore mine that was abandoned once the civil war broke out. The man that leads the tour is named Odacious and he used to work at the mine. It doesn't sound like much - to tour an abandoned mine - but it is a fun day out to the country-side and a great way to see some of the roads less traveled in Liberia. For starters the trip begins by piling into land rovers and then driving them onto a flat-bed railway car. We parked the land rovers on top of this rail car and then road the "train" of land rovers out into the country. There were some amazing sites and beautiful scenery along the way. Perhaps the most fun was the train ride. You are allowed to get out of the land rovers and sit on the top of the land rover or sit on the hood while the train is moving. The space between the land rover and the edge of the platform isn't very big, so you have to be careful to hold on or you could fall off the train. It was a really great day, but a long one. The train ride itself is over 3 hours one way, and then you are out in the country for several hours. It is a pack your lunch kind of adventure and no "proper" bathroom facilities. The last stop on the tour was a local "hospital". It was really cool to see a village hospital. The hospital has electricity only some of the time. When we toured, we went through the lab area where there were workers working in almost total darkness. Below are a few pictures of the hospital. All of the hospital beds have mosquito nets attached to prevent Malaria. There are a couple of pictures of signs that hang in the hallways of the hospital. "Community Health" messages encouraging mothers to breast feed, and another sign showing how to decrease a baby's fever. I think my absolute favorite part of the trip out to the country was to see the villages. We got to see some amazing parts of Africa, and see some village life. The best part was when the train would come through some of the villages the children would come running out of the woodwork it seemed just to wave and scream and laugh and greet us. Lots of adults too would look and wave and smile. WOW!! I still can't believe that this is where you are right now! What a great way to see Africa and it's people. It really puts it in to perspective how luxuriously we live! We are very blessed with nice clothes, cities and homes. Not too mention the hospital. And we think WBH beds are bad! I love the picture of the woman with the baby strapped to her back. So precious, just sleeping along the way. You are really getting the hang of posting the pictures. Keep 'em coming! Wow..whata reality check Jen!! We have nothing to complain about here. 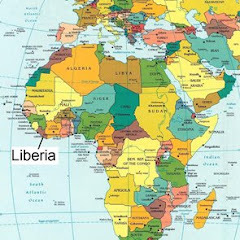 I'm so excited you're having so many adventures off the boat and are seeing other parts of Liberia. What better to help understand, communicate and serve your patients. Love it. Keep the pictures and updates coming, I may not respond every time, but I savor every word and image.